Irish Potato Cakes Recipe – What is your lasting childhood food memory? Nicola here from The Wonky Spatula with another Irish recipe this week I’m sharing my Mum’s winning potato cakes. My favourite mid-week meal growing up was smoked salmon with potato cakes, there’s just nothing like it! These potato cakes are so versatile you can team them with just about anything, whether it’s a full Irish at the weekend or a quick and easy side dish to your mid-week meals. This recipe is great for using up any leftover potatoes you have to lying around the fridge! 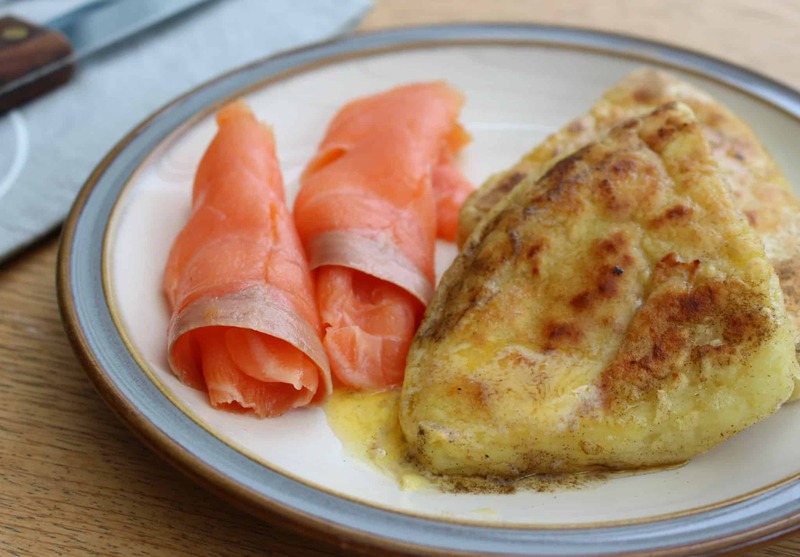 Irish Smoked Salmon is the perfect accompaniment to these delicious potato cakes! 20-30g of grass-fed butter, plus extra to serve – Kerry Gold is my go to! Place the potatoes in a large pot of cold water. Boil the potatoes for roughly 20 minutes until fully cooked and fluffy. Once cooked strain off the water from the potatoes and place back on your hob over a low heat to dry off for 2-3 minutes. Next, mash the potatoes, add the butter with a little sprinkle of salt and mix thoroughly. Stir in 3 tbsp of your chosen flour. Sprinkle the remaining tbsp of flour onto a wooden board and place the potato on top. Shape the potato into a circle and cover in the dusting flour. Slice the potato cake into 4 and heat a large frying pan over a medium heat. Place the potato cakes onto the dry pan and cook for 4-5 minutes a side, until they are nicely browned and starting to crisp. Either finish in the pan with a small knob of butter or add it on top when plating – whichever you prefer! Serve and enjoy with a generous helping of smoked salmon. I love to serve mine with an extra knob of butter! If you try out this recipe let us know in the comments below! I have used this same recipe for years but i add some finely chopped green onion to the mash.